I am incredibly patriotic. I love my country. I love other countries as well. I think that there is much to be learned from all of them, and that it’s incredibly important to learn from them. And I happen to love learning about them and their cultures. I’ve traveled a lot outside of the States and loved every minute of it. But this isn’t about that. This is about my country. I remember being in kindergarten during the Gulf War and learning the words to my favorite “USA” song – “I’m proud to be an American”. I remember singing it with pride and getting goosebumps, even back then, like I still do. This week in school, my Bigs will be learning about Country, State, and Town. I am very excited for him to come home knowing a bit more American history (for the purposes of tomorrow’s lunch). I made a PB&J star and added detailing (my vultures boys ate the scraps). I also packed honey wheat pretzel sticks, a mixture of jumbo raisins, white yogurt raisins, and dried cranberries, blueberries, strawberries, and Trader Joe’s yogurt star cookies (I used only the white color for this lunch). 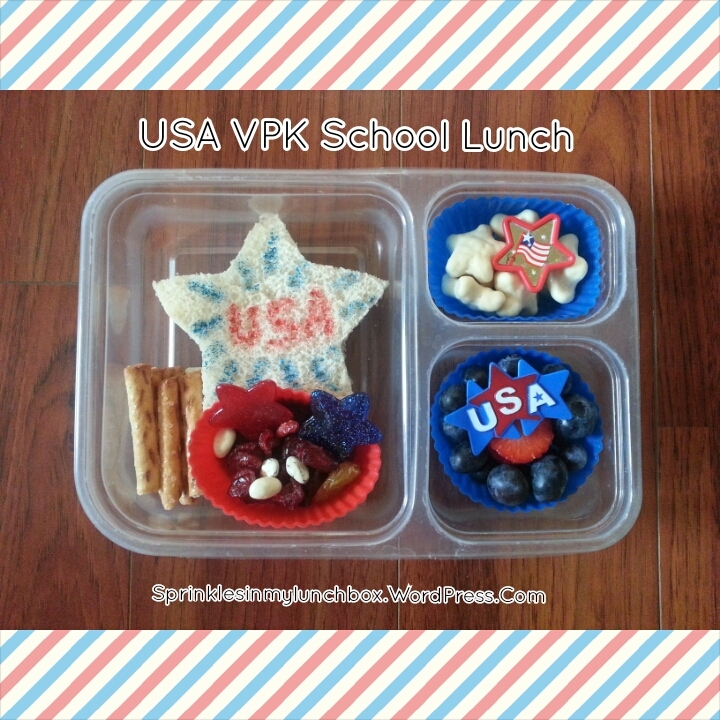 I used USA-themed cupcake picks and rings for decoration.